What have you done about your T&Cs? Header set Expires "Wed, 15 Apr 2020 20:00:00 GMT" Header set Cache-Control "public"
What have you done about your T&Cs? Even if it isn't a legal requirement you would be wise to ensure your website included your business, and website, Terms and Conditions. So many businesses have not got proper T&Cs in place. If you take money in return for a product or a service you really should published terms and conditions. From the business point of view it means that everyone knows where they stand. From the legal standpoint if things go wrong you have a much stronger position to fight your corner. I was speaking to a colleague of mine today, Micheal Milne, who was able to offer some words of wisdom concerning T&Cs. I always advise clients that they should independently arrange their business terms and conditions. I can offer many things but I am not a legal advisor. 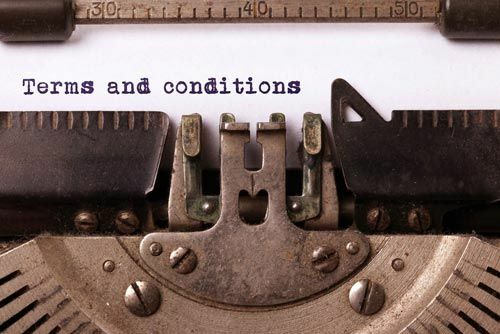 I can however advise that you should have your own terms and conditions written specifically for the business you are in and the the work and liabilities you may take on. Though you can download an 'instant' legal form from the web it can only ever be a generic solution. If your a builder and your scaffolding collapses who is responsible, you? The generic document probably doesn't cover such eventualities. So I can also advise, get proper advice, it's a bit like getting a decent insurance policy, but it really might prevent you having to pay out. I can strongly recommend talking to Micheal about arranging all this and ensuring you are in a strong legal position before things get a bit wobbly.